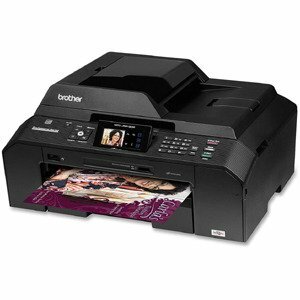 The�MFC-J5910cw All-In-One Color Inkjet Printer�from�Brother�prints up to 12 pages/minute in black and 10 pages/minute in color (ISO standard). The printer's 1200 dpi resolution provides high quality graphics and photos and its individual ink cartridges make color printing more affordable. Additionally, the available high capacity ink cartridges further reduce the cost of printing per page. The MFC-J5910dw can print borderless photos in common sizes up to 11x17, including Letter, Legal, 4.0x6.0", 5.0x7.0" and 8.0x10.0". The built-in scanner can handle page sizes up to 8.5x14.0 (using the ADF). The 35-page ADF can be used to scan multipage documents in one convenient step. The scanner features up to a 2400 x 2400 dpi when scanning from the flatbed and 2400 x 1200 dpi when scanning from the ADF. In addition to scanning to a connected computer, you can also scan to a compatible mobile device, a USB flash drive, a compatible memory card, or to a different computer on the network. Additionally, you can scan to email, a media card, a flash drive, or to a network destination. When scanning text, once your scan is complete you can convert the scan into editable text using the bundled OCR software. The bundled software also includes a converter that lets you save your scans as a PDF file. The MFC-J5910dw lets you copy color and grayscale documents up to 8.5x11.7" via the document glass or legal size using the ADF. The ADF can also be used to copy multipage documents in 1 easy step. The unit's touchscreen interface provides options such as 2-in-1 (useful for copying both sides of an ID onto 1 sheet), 4-in-1, resizing, and sorting. The embedded 33.6kbps modem transmits data at approximately 3 seconds per page. Using the ADF, you can send multipage faxes in both black and color. The MFC-J5910dw provides options such as broadcasting, fax forwarding, caller ID, and redial. Additionally, the machine has a built-in memory to store received faxes when no paper is available to print them. Besides a standard USB connection the MFC-J5910dw features both wired Ethernet and Wi-Fi connectivity, allowing you to share the printer over your local network. The built-in card slots provide the ability to print from and scan to a memory card such as an SD or Memory Stick. A convenient front-facing USB port provides the ability to print from or scan to a USB memory device. Additionally, Brother's iPrint&Scan app can be downloaded to your iPhone, iPad, iPod Touch, Android, or Windows Phone 7 device and enables you to print from and scan to your device. Duplex Printing:�Create professional quality two-sided documents up to 11x17"